Sandy Alcantara (Al-CON-ta-RA) Montero...married and has one child...is one of 11 siblings...left home at age 11 to live with older sister in Santo Domingo. Finished first season in Marlins' system with six Major League starts, posting a 2-3 record and 3.44 ERA (34.0 ip/13 er). In 19 starts at Triple-A New Orleans, went 6-3 with a 3.89 ERA (115.2 ip/50 er). Also had three rehab starts at Single-A Jupiter, where he had no record and a 3.97 ERA (11.1/5)...With New Orleans, reached 6.0-innings pitched in 12 of 19 starts, including six of 7.0-or-more. Tossed season-high 8.0 innings on May 17 vs. Round Rock, limiting Express to two runs on five hits...At time of final promotion, ranked seventh in Pacific Coast League in ERA (3.89). Among PCL leaders, ranked second in average against (.246), third in WHIP (1.25), and fewest base runners per 9.0 (11.67)...Had season-high eight strikeouts in season opener on April 7 vs. Nashville (4.2 ip)...In five April starts, limited opponents to one run three times, yet went 0-1. Received first decision, a loss, on April 29 at Nashville. Allowed four runs on seven hits and three walks, while striking out four, over 5.0 innings...In five May starts, posted 3-0 record and 3.15 ERA (34.1/12). Earned first win on May 4 at Omaha, allowing one run and four hits with a walk and five strikeouts over 7.0 innings...Two starts later, May 17 at Round Rock, tossed season-high 8.0 innings en-route to second win. Limited Express to two runs and five hits while walking none and striking out three. Followed that start with two 7.0+-inning outings...Made season debut with Miami on June 29, making first Major League start against Mets at Marlins Park. Allowed just one run on three hits with five walks and two strikeouts over 5.0 innings to record first Major League win...The night after his debut, Pablo López made his first career Major League start and also earned a win. The pair became the first set of teammates to earn wins in their first career starts in consecutive days since April 9-10, 2012, when Yu Darvish and Neftali Feliz each made their first career starts with the Rangers. The last National League team to have such a duo was the Reds on April 15-16, 1967 with Gary Nolan and Mel Queen. - Stats LLC...Made one start before being placed on the 10-day disabled list with a right axillary infection on July 4 (retro to July 1). Made three rehab starts at Single-A Jupiter, allowing six runs (five earned) over 11.1 innings before being reinstated and optioned to NOLA on August 6... Following return to New Orleans, went 1-0 with a 4.40 ERA (30.2/15)...Recalled by Miami on September 1 and made second start on Sept. 5 vs. Philadelphia. In that start, held Phillies scoreless on three hits and two walks, while striking out six, over a career-high 7.0 innings...Surrendered just two runs over 7.0 innings on September 13 at Citi Field. Allowed two hits and three walks, while tying a career best with six strikeouts. Surrendered just eight hits over first three career starts, marking second-fewest in Marlins history, trailing only Jarlin García, who allowed just five over his first three starts...On September 18 vs. Washington, took first career loss after allowing three runs on six hits with a career-high six walks and three strikeouts over 4.0 innings. With six hits allowed, surrendered a total of 14 hits over first four career starts, equaling Sean West and Josh Beckett for third fewest hits allowed in first four career starts. Jarlin García holds record for fewest hits allowed by a Marlins starter over his first four career starts (10), in front of Brad Hand (13). - Elias...In final start of season, Sept. 30 at the Mets, tied a season/career high with 7.0 innings pitched, holding New York to one run and four hits. Walked two and struck out 10, becoming fourth Marlins starter (third rookie) to record 10+ strikeouts in 2018. Caleb Smith struck out 10 Brewers on April 22 at Miller Park; Trevor Richards recorded 10 strikeouts on April 25 at Dodgers; and Wei-Yin Chen recorded 10 strikeouts on August 25 vs. Atlanta. Spent majority of season at Double-A Springfield, while also making Major League debut after a September call-up...Established professional highs in wins (7), appearances (33), and innings pitched (133.2)...At Springfield, went 7-5 with 4.31 ERA (125.1 ip/60 er) in 25 appearances (22 starts)...Earned win in first start of season, April 7 at Frisco, allowing just four hits over 6.0 shutout innings. Walked one and struck out four...Struggled over next eight starts, going 1-4 with 8.12 ERA (41.0/37) with 15 walks and 39 strikeouts...Allowed season-high seven runs over 3.2 innings in second start of season, April 13 vs. Frisco. Equaled high over 5.0 frames on May 13 at Arkansas... Finished Double-A campaign going 5-1 with 2.64 ERA (78.1/23) over final 16 appearances (13 starts)...Struck out season-high eight at Tulsa on May 6 and again on August 12 at Corpus Christi...Had contract selected by St. Louis on September 1 and made debut on Sept. 3 at San Francisco...Allowed one run and two hits over 0.2 innings, surrendering eighth-inning leado? home run to Tim Federowicz. Recorded first MLB strikeout three batters later (Buster Posey)...Struck out side on Sept. 15 at Cubs, retiring Jason Heyward, Javier Báez and Ian Happ in the ninth inning...In eight appearances with Cardinals, had no record and 4.32 ERA (8.1/4)...Made five starts for Surprise in Arizona Fall League, going 1-2 with 4.20 ERA (15.0/7)...Made two appearances for Gigantes del Cibao in Dominican Winter League, tossing 1.2 scoreless innings. Made a career-high 23 starts between Peoria (A) and Palm Beach (A)...Led all Cardinals minor leaguers with 153 strikeouts and ranked 5th among Cardinals minor leaguers in K/9 IP (11.23)...Ranked 5th among all minor league Class-A level pitchers with 153 strikeouts and 5th in the Midwest League (119)...Ranked among Cardinals minor league pitchers in opponent BA (.225, 3rd) and games started (23, T8th)...Struck out 10 or more batters five times, four in Peoria and once in Palm Beach...Fanned a career-high 14 batters over 6.0 innings at Beloit (5/23) in a no decision on 98 pitches...Pitched 11.0 scoreless innings from 4/21-28...Suffered four losses in Palm Beach despite allowing one run in two of the losses, and allowed just one run in three of six starts...Did not allow a home run to his last 245 total batters faced to finish the season...Rated as the No. 6 prospect in the Cardinals organization by Baseball America. Led the Gulf Coast League in games started (12), innings pitched (64.1) and total batters faced (267)...ranked among the league leaders in lowest opponent BA (.244, 2nd), strikeouts/9 IP (7.13, 3rd), walks/9 IP (2.80, 3rd) and fewest baserunners/9 IP (11.75, 3rd)...had six starts of 6.0 or more innings with a career high of 7.0 scoreless IP at GCL Marlins (7/3). Led the Dominican Summer League with nine losses...tied for the league lead with six other pitchers with one complete game (vs. DSL Nationals, 8/21)...ranked 6th among Cardinals minor league pitchers with a .253 opponent BA...earned his first professional win vs. DSL Yankees (6/12) firing 5.0 scoreless innings of two-hit ball. September 1, 2018 Miami Marlins recalled RHP Sandy Alcantara from New Orleans Baby Cakes. August 6, 2018 Miami Marlins optioned RHP Sandy Alcantara to New Orleans Baby Cakes. 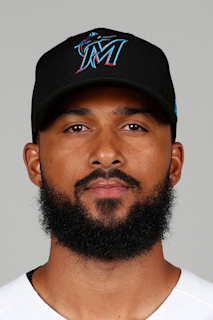 July 23, 2018 Miami Marlins sent RHP Sandy Alcantara on a rehab assignment to Jupiter Hammerheads. July 3, 2018 Sandy Alcantara roster status changed by Miami Marlins. June 28, 2018 Miami Marlins recalled RHP Sandy Alcantara from New Orleans Baby Cakes. March 20, 2018 Miami Marlins optioned RHP Sandy Alcantara to New Orleans Baby Cakes. December 14, 2017 Miami Marlins traded LF Marcell Ozuna to St. Louis Cardinals for LHP Daniel Castano, RF Magneuris Sierra, RHP Sandy Alcantara and RHP Zac Gallen. December 5, 2017 RHP Sandy Alcantara assigned to Gigantes del Cibao. September 1, 2017 St. Louis Cardinals selected the contract of RHP Sandy Alcantara from Springfield Cardinals. April 4, 2017 RHP Sandy Alcantara assigned to Springfield Cardinals from Palm Beach Cardinals. February 16, 2017 St. Louis Cardinals invited non-roster RHP Sandy Alcantara to spring training. July 30, 2016 RHP Sandy Alcantara assigned to Palm Beach Cardinals from Peoria Chiefs. April 2, 2016 RHP Sandy Alcantara assigned to Peoria Chiefs from GCL Cardinals. March 12, 2016 RHP Sandy Alcantara assigned to St. Louis Cardinals. June 22, 2015 RHP Sandy Alcantara assigned to GCL Cardinals. March 7, 2014 RHP Sandy Alcantara assigned to DSL Cardinals. July 2, 2013 St. Louis Cardinals signed free agent RHP Sandy Alcantara to a minor league contract.